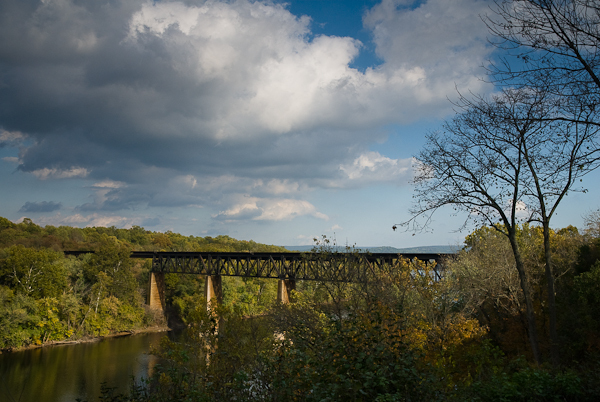 The trestle across the Potomac River, as viewed from James Rumsey Monument, is the Norfolk Southern Railroad Bridge at Shepherdstown, West Virginia. Recommended touring combo: spending an afternoon (or more) at Antietam National Battlefield a few miles across the river in Sharpsburg, Maryland and then supper at The Press Room in Shepherdstown. 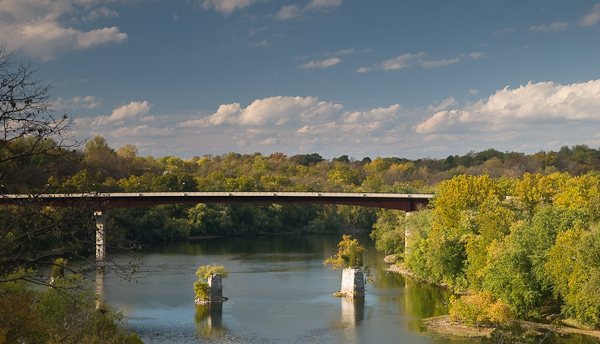 Gallery | This entry was posted in Autumn, Mid-Atlantic, Old Photographs, Shepherdstown, Travel, West Virginia and tagged 2010, autumn, fall, James Rumsey Monument, Norfolk Southern Railroad Bridge, October, Potomac River, Shepherdstown, West Virginia. Bookmark the permalink.